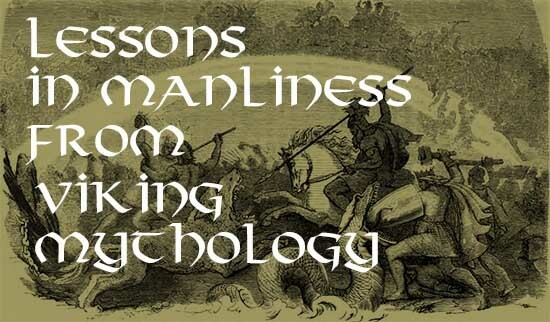 So far in this series we’ve taken an in-depth look at both Odin and Thor. 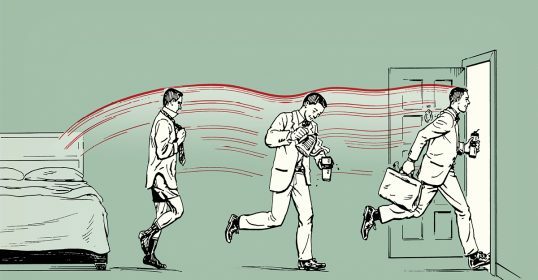 We’ve been through their stories, and figured out some ways in which their mythological examples can help men be better men. Those two are truly the titans of Norse mythology. We’ll end this series by offering two shorter profiles of a couple of figures who don’t star as prominently in Viking tales, but still offer insight into Norse culture and masculinity: Tyr and Loki. The former provides a mythological example of honorable manliness to us moderns, while the latter shows us how not to be a man. Let’s tackle Tyr first. Tyr is a fairly recognizable name among Scandinavian people and Norse enthusiasts, but doesn’t have much mainstream recognition. This is likely due to the fact that he hasn’t starred in a Marvel movie (yet), and that there’s really only one prevailing myth about him (which we’ll get to in a bit). This lack of surviving Tyr-centered tales is surprising, as he’s the “guarantor of justice” and sometimes even called the boldest of the Norse gods — one who inspires heroism and courage. With that pedigree, you’d think there would be more myths surrounding him. Well, at one time, there probably was. Prior to the Viking age, the Northern Germanic people had a similar set of gods and goddesses. They were more primitive, however, and not as fleshed out. In that pantheon, Tyr was perhaps the chief god, and went by the name Tiwaz. He was one of the war gods, and seemed equivalent to the Roman Mars. Like Tyr, his primary characteristics were honor and justice and courage. By the time of the Vikings, however, the centrality of Tyr/Tiwaz was supplanted by Odin and Thor. This tells us something of the different cultures. In the Germanic world of the early and mid-100s, battle was crucially important. Courage and bravery in war was something deeply foundational to a man’s life. When the Vikings gained prominence, that foundation changed a little bit. Martial courage was certainly still valued, but the Norsemen were raiders and pillagers rather than soldiers on a battlefield. They took seaside ports by surprise with their longships, and quite simply outmuscled their foes. So a standard that encompassed wisdom, cleverness, and strategy, coupled with pure strength, took hold — the chief characteristics of Odin and Thor. Thus Tyr took a backseat, relegated to being a minor god. 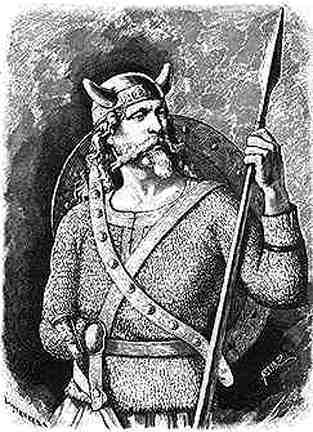 As I mentioned above, however, there is one important myth about him which shows his character, and offers a great lesson for both Viking men and those of us in the modern world. 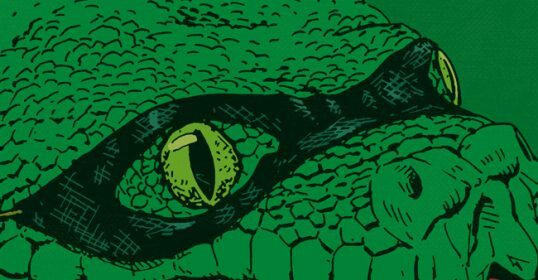 Loki — the wily trickster — was father to three great and terrifying beings: Jormungand — the world-encircling serpent, Hel — the death goddess, and Fenrir — the great wolf. The other gods had a terrible foreboding about these offspring of Loki, and took action to keep them at bay. They threw Jormungand into the ocean, relegated Hel to the underworld, and kept Fenrir in Asgard so they could keep a close and watchful eye on him. Even when the wolf was just a pup, only Tyr had the courage to feed Fenrir. The beast grew and grew, however, and the gods decided they could no longer keep him in their home. Knowing the destruction Fenrir would wreak were he to be set free to roam the world, they decided to try to bind him with various chains and ropes. 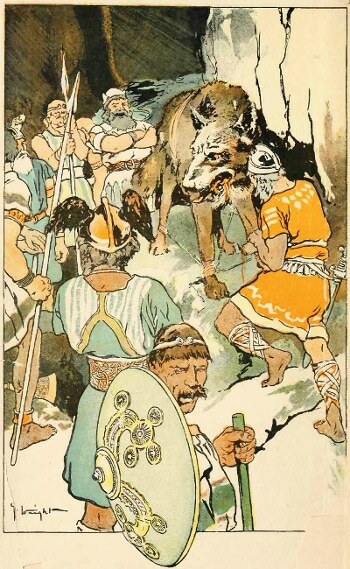 To get Fenrir to consent, the gods would tell him that these bindings were merely competitions of strength; they even clapped and cheered when the wolf broke through each attempted constraint. Desperate for a solution, the gods sent down word to the dwarves — the greatest craftsmen in the universe — to create something that not even Fenrir could wrestle free from. They forged Gleipnir — a rope which was made from the sound of a cat’s footsteps, the beard of a woman, the roots of a stone, the breath of a fish, and the spittle of a bird. Since these things don’t exist, it’s futile to struggle against them. When the gods presented Gleipnir to Fenrir as yet another challenge of strength, he grew suspicious. The rope was too light and silky; how could it possibly hold him? Something was afoot. So he insisted that he would not be bound unless one of the gods placed a hand in his jaws as a sign of good faith. Tyr — knowing full well the ramifications of his decision — was the only god to step forward. 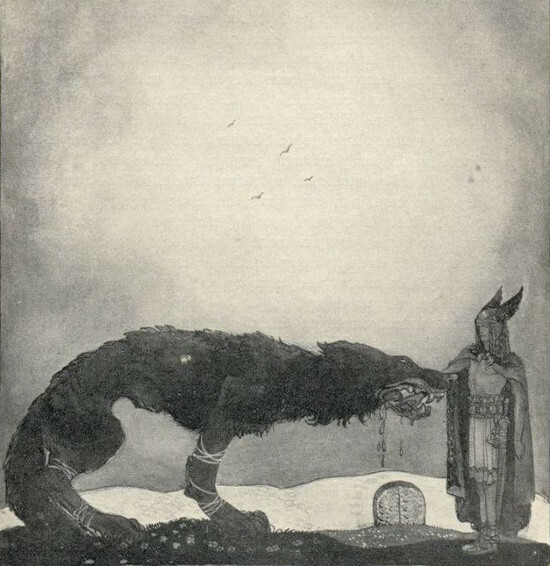 Fenrir was bound, and of course took Tyr’s hand as retribution. From thence on, Tyr carried a permanent disability and scar which spoke of his bravery for the sake of the entire world. You’ll remember that Odin sacrificed an eye for the sake of gaining wisdom. It was in many ways a selfish pursuit — sure, others benefited, but he was primarily seeking knowledge because he had a ravenous desire for it. Tyr also sacrificed himself physically, but it was largely for the sake of his community. 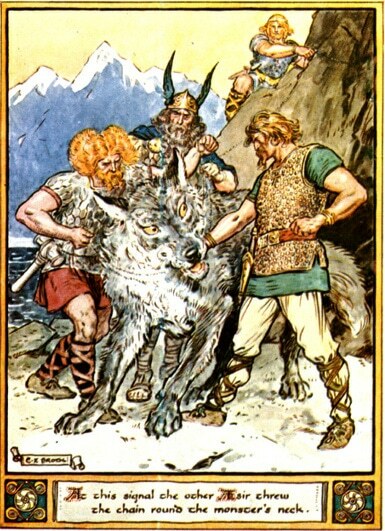 Yes, Fenrir’s binding obviously gained Tyr security as well, but ultimately his motivations were directed towards helping his peers as well as the humans, who resided below Asgard in Midgard. Sacrifice for the sake of bettering yourself is certainly a good thing. Better yet, though, is to sacrifice in a way that also benefits others. That’s the essence of legacy. In giving up his hand, Tyr both made the world safer and won a place of honor among all of the gods. He earned the respect of his peers, and was elevated among them as being the most courageous of all. Sure, Thor was the strongest, but how courageous are you really when your strength is second-to-none? Just as Christians look to and draw strength from the sacrifice of Christ, Vikings (and even modern followers of the old Norse religion!) looked to Tyr in much the same way. His example imparted courage and bravery. If Tyr could sacrifice his hand — something crucially important to a war god — then surely even common folk could make small sacrifices for the sake of their kith and kin. Serving other people is easy when it fits into our schedule and our talents. Far more difficult is it to serve our community when we’re tasked with doing something we don’t enjoy, or that we aren’t good at, or that we know will bring some amount of financial or physical pain. And that last one is the toughest, isn’t it? Physical sacrifice hurts in a very literal way, and can have lasting physiological (and even psychological) consequences. And yet it’s been a moral imperative that men have shouldered for thousands of years. Cavemen would risk their lives to go hunt dinner, explorers and frontiersmen traversed great spans of sea and land to find a better life (and many didn’t come home), and today, first responders — the vast majority of them men — put their wellbeing on the line every day. And in times of danger and disaster, average men continue to put their own lives on the line to protect others. Opportunities to make physical sacrifices do not always arise in our generally safe and secure modern world, but a man should be ready if/when such an exigency arises. Tyr certainly didn’t want to lose his hand to Fenrir that day, but when the community was in dire need, he stepped forward. 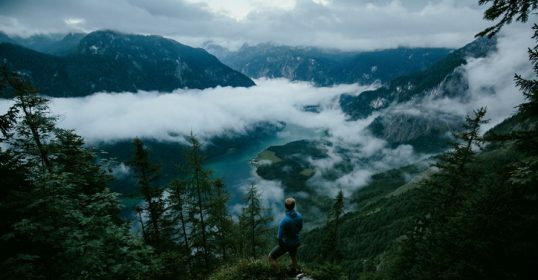 Beyond physical sacrifice, there are other ways to serve those around you in difficult circumstances. 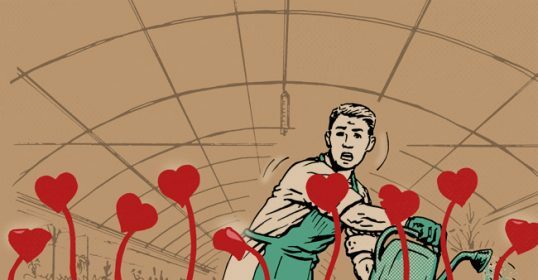 Maybe you serve on the board of a bureaucratic, stuck-in-their-ways local non-profit because you know it can better the community, or the next time a friend (or neighbor, or acquaintance) asks for help moving, perhaps you’ll actually say yes. Will you be the kind of man who serves only when it’s easy and convenient? Or will you, like Tyr, willingly extend a hand, even when you know it will cost something? Next time, we’ll take a look at Loki, the wily trickster of the Norse world.